Stay in style, at The St Patrick Square Residence. 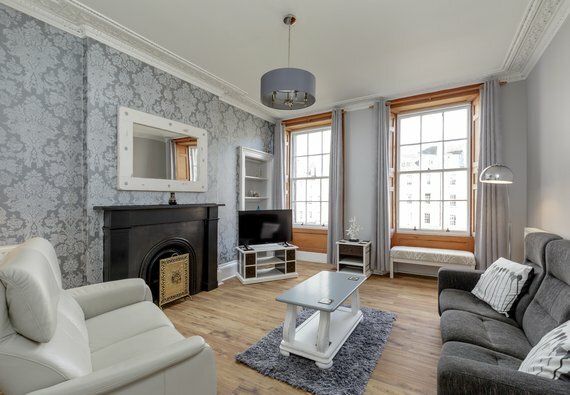 Newly renovated and located just a haggis’ throw from The Royal Mile and Edinburgh Castle, this gorgeous two-bedroom, second-floor apartment is simply perfect for your next visit to Auld Reekie. Spread across over 1,110 feet of exquisite Georgian architecture, the first thing you’ll notice is how much space and light the apartment spoils you with. The large living room retains classic period features, such as glorious double-fronted windows, original cornicing, and a statement fireplace, yet has been lovingly updated with modern touches and creature comforts to suit the 21st century traveller. Comfy couches, flat screen Freeview TV, Bluetooth speakers and unlimited WiFi welcome you home after a long day’s sightseeing. The contemporary kitchen is ready and waiting to take your self-catering visit to the next level. You’ll find everything you need, including washing machine, microwave and a coffee machine, all housed in a seriously chic remodelled design. When it’s time to dig in, move through to the adjoining dining room, featuring a large dining table for up to six guests. Two generously sized double bedrooms are decorated in calming neutral tones, ensuring a peaceful night’s sleep. There’s plenty of room to stretch out, as one bedroom boasts a king-size bed, and the other benefits from the flexibility of a hotel style zip’n’link which can be set up as either a super-king or twin beds. Your morning freshen-up comes courtesy of a large, walk in shower, and a separate, modern WC completes this delightful home-from-home. In terms of location, you couldn’t wish for more! Saint Patrick Square is set back from Clerk Street, one of the main arteries running up from Edinburgh’s Old Town, which means that you’ll be in the famous Medieval heart of the city in a mere five-minute stroll. The New Town, home to our best shopping and National Galleries, starts at Princes Street just a 15-minute walk from the apartment. Here for the Festival? Perfect! George Square and Pleasance are both only a few hundred yards away, and you’ll find pretty much every other venue sprinkled within a half mile radius. Also on your doorstep (ok – just around the corner) is The Meadows. On a sunny day, the whole of Edinburgh empties out on to this beloved park to soak up the vitamin D. You’ll see everyone from young families to acrobats and musicians practising their crafts, so pick up some snacks and join the crowds for a true slice of local life. As for the practical stuff, you’re in a great neighbourhood. Clerk Street is lined with everything from supermarkets and pharmacies, to pubs and restaurants, and seemingly endless artisan coffee cafes, sandwich shops and bakeries. If you want to go a little further, there’s a bus stop right outside with services reaching all corners of Edinburgh. Exterior This apartment forms part of a traditional Georgian tenement building. Interior layout A central hallway leads to a living room, separate dining room with adjoining kitchen, two double bedrooms, a shower room and separate WC. No reviews yet for The St Patrick Square Residence.